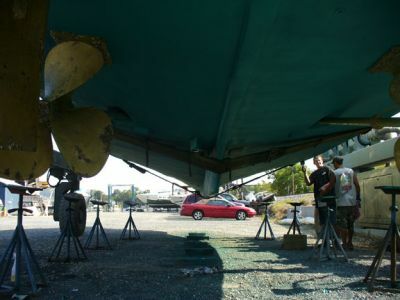 October 2014: Seven Seas located at Mears Marina on Kent Narrows lifted her, power-washed, sanded and then painted with paint supplied by us. We chose to try out West Marine PCA Gold and went with Black color this time. 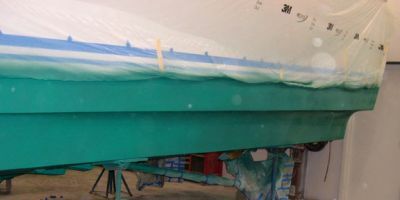 the info read: PCA with Irgarol is a premium ablative antifouling coating that provides multi-season protection for all boats in all waters. The combination of cuprous oxide and Irgarol, an anti-slime additive, provides excellent protection against shell, weed and slime fouling. The guys at "Seven Seas" did a nice job and were attentive to our needs. 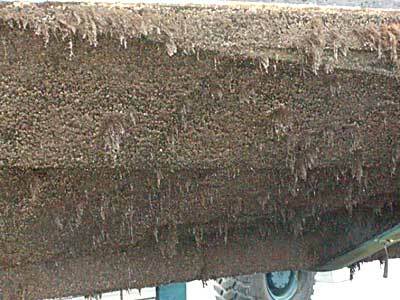 The boat was growing a beard from being at Kent Island since December, 2005. 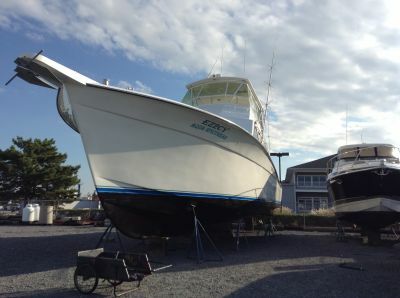 We can't wait to get Sea Hawk paint on her bottom. We don't want to have to shave her again! No wonder we could not plane the boat - take a look at this beard! I had a diver clean the hardware. The previous owner had said they had used a micron-type product. We are switching to Sea Hawk! It took over 1-1/2 hours to powerwash the bottom. The bottom will be sanded smooth by Anchor Bay and two coats of Sea Hawk bottom paint will be applied. 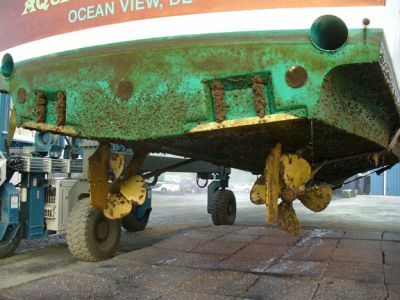 Sea Hawk is the only paint manufacture to give a written warranty on it's bottom paint. Why take chances and waste fuel? Sea Hawk it is! 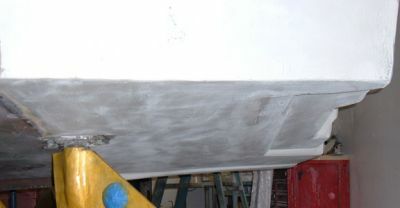 We are preparing the new addition for a barrier coat by sanding with 150 grit. 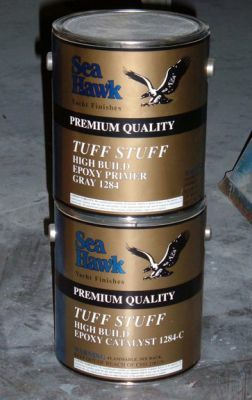 For the barrier coat, we are using a product from Sea Hawk called Tuff Stuff. Sea Hawk has quality and an unparalleled warranty - all that each of our boats deserve. The second coat of Sea Hawk Tuff Stuff barrier coat has been applied. We found this product very easy to work with and recommend it highly. Second coat has been applied. Sea Hawk Teal! Bring on the gulf stream colors. Sea Hawk Teal has been added. 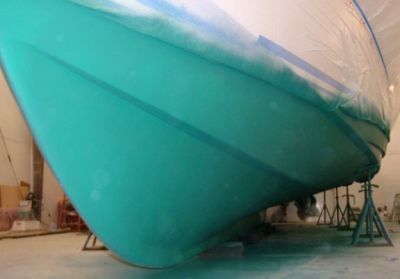 The painter who sprayed the Sea Hawk applicaion felt it went on smoother than other paint he has ever sprayed. This is over ten months of sitting in Bear Creek. 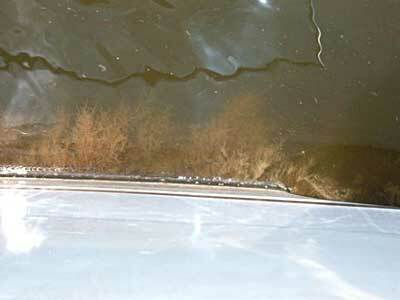 The boat did not move other than an idle to and from up the creek about 1/2 mile. This creek is notorious for growth problems. I am very impressed with Sea Hawk! Other boats from this creek that ran often but used other brands of paints seemed much worse. This is much better than the beard we had in the past after sitting. In addition, the hardware coated with PropSpeed was relatively clean. 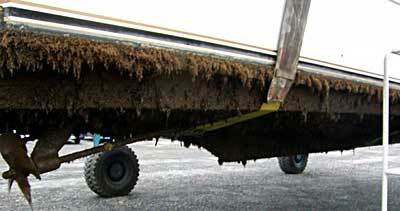 Barnacles on the shafts and trim tabs were easily wiped off with a cloth. 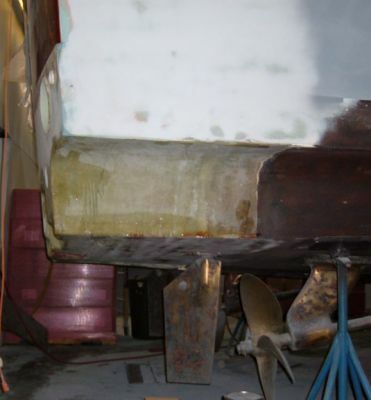 The build-up on the struts and rudders were a little more stubborn but still quite easy to remove with a cloth wrapped PC of wood. The props had surprisingly little growth. But part of the growth that was on them had to be removed with a scraper. I believe we could have done a better job on the application of the props if they had been off when doing them. 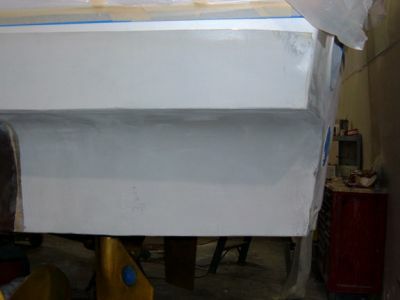 Once we run the boat and get props tweaked, we will certainly coat them again. Note how much build-up was on the trim tab cylinders - these had no coating. The bottom was sanded with 80 grit and a fresh coat of Sea Hawk's newest paint creation was applied. 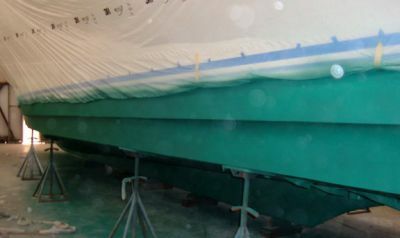 From now on the boat will not sit and the paint will get a real life test.